Our Anti-Spin rubber BUFFALO has quickly become a benchmark as an extraordinary weapon for blocking close to the table with high spin reversal. 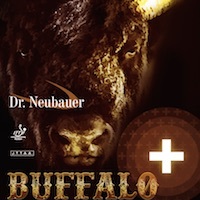 This new version BUFFALO+ produces yet again a bit more spin reversal. BUFFALO+ will enable you to return the ball short and low including against fast topspin shots. The ball "dives" on the other side of the table. The rubber can still be used for aggressive pushing in order to put some pressure on your opponent. Also control could be slightly enhanced.